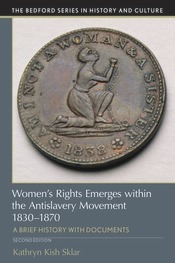 Combining documents with an interpretive essay, this book is the first to offer a much-needed guide to the emergence of the women's rights movement within the anti-slavery activism of the 1830s. The introductory essay places a new focus on the relationship among campaigns against racial prejudice and the emergence of the women’s rights movement, tracing the cause of women’s rights from Angelina and Sarah Grimké's campaign against slavery and the emergence of race as a divisive issue that finally split that movement in 1869. A rich collection of nearly 60 documents—10 of them new--includes a range of voices, from free black women activists such as Francis Watkins Harper and Sarah Mapps Douglass, to Quaker abolitionists and their opponents. Document headnotes, maps and illustrations, a chronology, questions for consideration, a selected bibliography, and an index have been updated and enrich students' understanding of this period.